This past weekend was spent at an employee reunion in which we reminisced about days working in the Old Faithful area in the mid-80’s. We all admitted it was a life-changing experience as we laughed over stories, adventures, and friends we had met in the summers spent in our first national park. It was lots of fun with the highlight of the weekend being a trip to the top of the Old Faithful Inn. 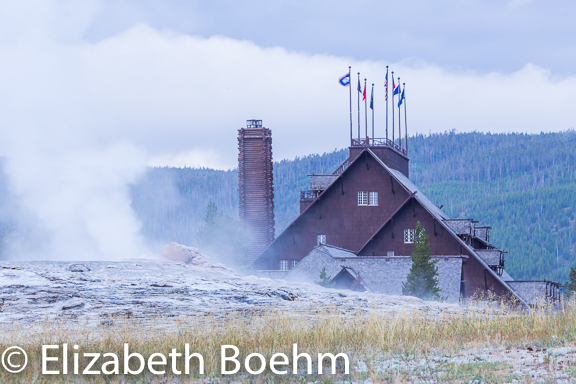 I left the “big lens” home knowing photography was not priority for these several days but I did plan to photograph in the geyser basins. 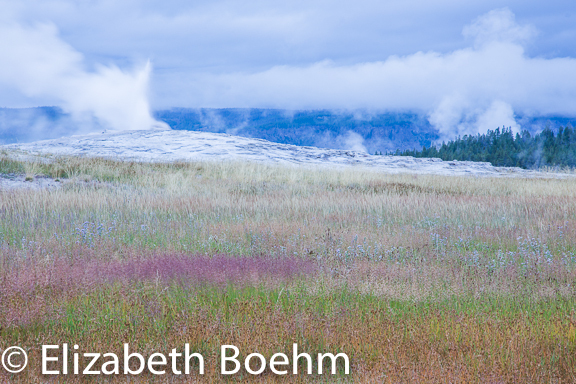 Upon arrival, I immediately noticed the colorful grasses in the area surrounding Old Faithful and made a note to myself to return first thing in the morning. I did. The weather was cloudy but the colors were great and I had hopes for just a brief amount of sunshine with the erupting geyser. No luck, on either of the mornings I was there. The clouds made for slow shutter speeds and blurry water spouts which were unique to the typical Old Faithful photo. The geyser basin was quiet and calm at first light in August, but by the second eruption of Old Faithful the crowds were up and moving. It was fun to see folks from around the world enjoy one of our national treasures! I myself have seen the geyser spout off on numerous occasions and each eruption is powerful and unique. 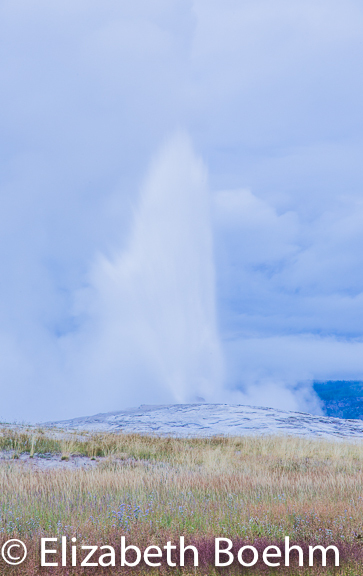 I again found myself wishing I had just one more day to catch this geyser in a little, different light!